Last night I went into Toronto to play with Lisa (currently undergoing a trifecta of woe), and had enough time before dinner to have an hour or two of sitting and knitting at The Purple Purl and ruminating on yarns for future design samples. (The marshmallow squares continue to be to die for). 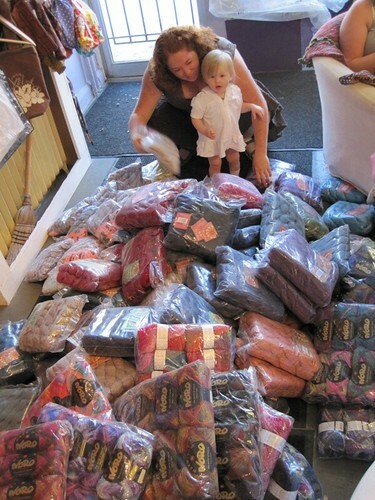 I stayed long enough, however, to witness that sacred event, delivery of new bags of yarn into the Local Yarn Shop. This is a sight to behold, so much Noro. I managed to resist buying any. For now. I might need more striped knee socks in my future, though. Just maybe. Ooohh…. pretty… And yes, I think you do need more striped knee socks, I mean, who doesn’t? when you were talking about a yarn avalanche, i thought it your sock yarn stash had fallen on you! I love those marshmallows squares like you wouldn’t believe. And is that Tanis in Royal Flush? I have some of that too and I’m thinking of making striped socks with that (and the color Peacock). However I’ve been dragging my heels for two reasons: 1) I have x-mas knitting I’m trying to get done 2) I have no idea how to carry the yarn up and I can’t find a good reference for it so I’ve held off. I’m sure its easy but its one of those “it’s so easy you really need someone to tell you how to do it” kinda things. Oh, and I guess I have one more reason: 3) I’m thinking I might need a third skein for a third stripe like a white or something. What say you Super Designer Lady? Your striped stockings are so fabulous, of course you need more! I’m impressed by your willpower, though. That’s one avalanche I wouldn’t mind being caught under. What’s the word I’m looking for? Oh. Yes. I would love to jump into that! the first picture is like a lovely dream! yum! 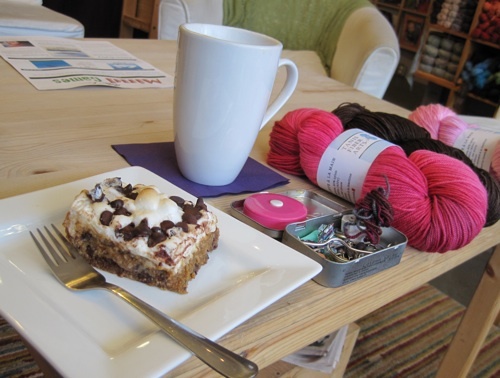 Yarn and cake. It doesn’t get much better than that does it? That marshmallow square… looks… yummy. Must investigate when I am back in the city. Looks like a fun afternoon! I just want to jump in that pile and roll around! Oh my…. all that Noro! How could you stand it! I would have been rolling around on the floor! I, too, would have been rollling in the pile of yarn, giggling like an idiot! The marshmallow square looks de-lish, and I’m so glad you guys introduced such a young, future knitter, to the beauty of Noro!